Okay, so who of you believed the urban legend that your stomach would explode if you mixed Pop Rocks with carbonated soda? Regardless, this candy was awesome! Like little firecrackers exploding in my head. Did you know General Foods stopped selling it in ’83. That surprised the heck out of me. Thank goodness for Dr. Marvin Rudolph who helped bring them back! LOVE those things. Happy Throwback Thursday, everyone. This entry was posted in Uncategorized and tagged 80s candy, General Foods, Lynn Rush, Pop Rocks Candy, Throwback Thursdays, urban legends by Lynn Rush. Bookmark the permalink. Yeah, I’m not a big fan of them either. There was a time when I wanted to try that experiment, however, after seeing the movie Urban Legends, I changed my mind–even if it wasn’t exactly true. I will say, however, that it is INCREDIBLY entertaining when your 8-year-old accidentally spills them on the floor and the dog licks them up. Danica–I’ve bought them within the last couple years….LOL. I feel like such a kid too. It’s fun! 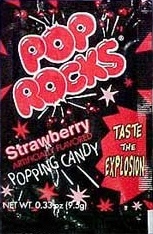 I always feel like a kid when I see Pop Rocks at the store. I haven’t bought any, so far, but the temptation is there. It’s as though the child inside me just wants them so much and the grown me tells her she doesn’t need candy, lol. Great throwback!